Chelsea have reportedly turned down advances from Barcelona to sanction the sale of Willian during the ongoing transfer window. The Brazil international was heavily linked with the Blaugrana during the summer but a move failed to materialise with manager Maurizio Sarri requesting the Blues to keep hold of the attacker. Ernesto Valverde's side followed to pursue Malcom from Bordeaux to fill the attacking void but the transfer has not worked out with the winger struggling to find his feet in the Spanish La Liga. According to The Telegraph, the Blaugrana had recently approached the Blues with Malcom and an additional £50m in order to secure the services of Willian this month. 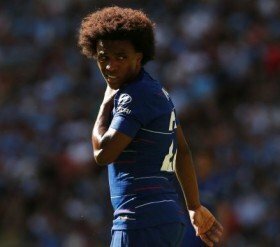 However, the proposal has been swiftly rejected by the west London side, who are said to value Willian much higher despite Malcom being offered as a makeweight. The 30-year-old is expected to feature for Chelsea from the beginning when they entertain Newcastle United in the Premier League on Saturday evening.